Many Egyptologist (including Dr. Zahi Hawas, former Minister of State for Antiquities Affairs) insist that Sphinx was built nearly 4500BC, by the builder of 2nd pyramid of the Giza Plateau .i.e. the pyramid of Chephren (also read as Khafre, Khefren and Chephren). But other researchers like John A. West and Robert Bauval (who first put forwarded the “Orion correlation theory”) believe that the both pyramids & Sphinx are much much older then Egypt civilization. Here I’m summarizing some extracts from their research paper where they are trying to prove that Sphinx is atleast 10 millennium BC old. As stated by other Egyptologists, the Sphinx is actually built by Chepren, and he put his face over the body of the Sphinx. Detective Frank Domin-go (from US police department) carefully measured the Chephren statue and directed the photographer to get exact profile and full-face views of the Sphinx. Despite the damage to the Sphinx’s face, the statue and the Sphinx share enough undamaged reference points for Mr. Domingo to compare their facial structures. Using his police procedures, he produced an artist’s impression of the Sphinx as it might have looked originally. His report concludes: “After reviewing my various drawings, sche matics and measurements, my final conclusion concurs with my initial reaction: the two works represent two separate individuals. You can see the clear difference in below image. This proves that current head of the Sphinx isn’t the face of pharaoh Chephren. Either the head was re-carved or it wasn’t build by Chephren. The erosion over the body of Sphinx is both vertical, as well as horizontal. When stones are exposed wind and sand, the layers become soft and get erosion horizontally. This is a common type of erosion and can be found throughout the Egypt. The Sphinx has something different. The erosion is from top to down vertically, making a rounded shape structure over the body of the Sphinx. This kind of erosion can be made only by heavy rain fall and by flow of a water from top to down. That means (there was some time in history when) this desert of Giza has experienced a heavy rainfall and hence even the hard limestone of Sphinx got erosion from water. The question is: when Giza plateau had this much rain in the history, which caused water damage? The answer is surprising. It was 12,000 year ago, at the end of last ice age. At that time major part of the earth was covered by thick layer of ice, and it all melted down in the span of 2 to 2.5 thousand years. This made heavy flood on earth, along with thunderstorms and rain. 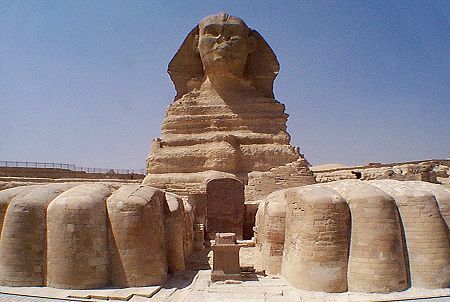 The continuous rain damaged the Sphinx, and soon after this flood the whole Giza plateau converted into desert savanna. The sphinx was covered with thick layer of sand which saved it from further damages. The face/head was over the surface and hence it faced the weather for next thousands of years. According to “Orion correlation theory” by Robert Bauval, the three pyramids are terrestrial map with three stars of Orion constellation. And in the astronomical movement/rotation of stars & constellation, this mapping was occurred exactly 10,000 to 11,000 years BC. Robert Bauval and his co-worker Graham Hancock believe that Sphinx is served as astronomical markup for vernal equinox. When Sphinx was supposedly built in 2,500BC, the Sun rose in the constellation of Taurus. If the ancient engineers wanted to build an astronomical apparatus, then they must have had to choose the shape of Sphinx which exactly matches with the constellation of that time. As the Sphinx is in shape of Lion, then the only constellation matches with Lion is the LEO. And surprisingly, the Sun rose in the constellation of LEO in 10,500BC. Only that epoch in the history matches with the constellation LEO. In the age of LEO (10,500BC) when the Sphinx was built as astronomical markup for vernal equinox, it was built like it is gazing its own image to east. The above facts and researches make me convinced that the Sphinx, as well as the pyramids were built much much before the Egypt civilization. The water erosion, the Orion correlation and the theory of age of LEO all together strongly claim that the Sphinx is older, not less then 10,500 years. This entry was posted in Saunterer Soul and tagged Ancient Egypt, Sphinx, Sphinx As Astronomical Apparatus, Sphinx Water Erosion.